everydaymatters: I Don't Want To Wait. This weekend was Bridget and Ed's wedding, and it was absolutely beautiful. At the reception Josh and I were sitting at a table discussing our wedding. I've heard soooo many girls complain about how their guy doesn't care about getting married and won't have anything to do with planning. While we were talking Josh said something to the effect of that he can't wait until it's our wedding and it's all people we know. Which might have been because he didn't know anyone but I'd like to believe its because he's ready to get married and he's excited about it. : ) Take it how you want. 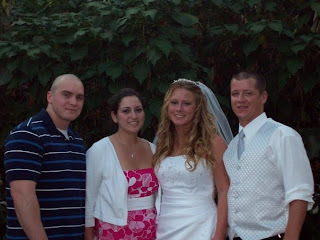 Here is us with the beautiful bride and groom. We had so much fun.